This warm, rich, and comforting stew is everything we love about southern food. 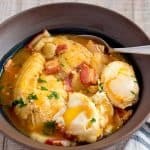 And the eggs add a decadent nature to the stew that is unmatched. Using sauté setting – add bacon to pot and cook until almost crispy. Add tomato paste to pot, mix well, and cook for about 1 minute. Add garlic and cook for another minute. Then turn off heat. Add a layer of potatoes, followed by a layer of onions. Season with 1/4 teaspoon of salt. Add a layer of fish and season with 1/4 teaspoon of salt. Repeat layers again, ending with a layer of fish on top. Pour in seafood stock. You want the liquid to just barely touch the bottom of the top layer of fish. So, if need be, add a little water to achieve that. Lock lid and cook for 3 minutes at high pressure. Once cook time is complete, quick-release pressure. Remove lid and skim as much fat from the top as you like. I think a little fat is good, but you can skim it all off if you like. Switch back to sauté setting. Crack eggs into empty spaces on top. Once all the eggs are in, switch back to “keep warm” setting and place the lid back on pot. Allow edge to poach in the residual heat. For slightly runny eggs (like I prefer), let them sit for about 7 minutes. But for hard cooked eggs, it’ll probably take 15 or so. To serve… Gently scoop out stew, making sure to get all the way to the bottom so that you get some bacon! Top each bowl with an egg or two.